Comments: This collection collects issues twenty-five to twenty-eight. Classic Peanuts Strips by, Charles M. Schulz and colors by Justin Thompson & Katherine Efird. “It’s Summer Camp, Charlie Brown” Story by Charles M. Schulz, Adapted by Paige Braddock & Vicki Scott, Art by Vicki Scott, Inks by Paige Braddock, Colors by Bill Bedard and Letters by Donna Almendrala. Charlie Brown gets to go to summer camp. Life at camp for Charlie Brown and his friends is anything but ordinary. Poor Chuck even here he has problems. We do get to see some funny situations. A man’s or a boy’s best friend is his dog. Charlie Brown and Snoopy are that and more. Well Charles returns home to find he was not missed. Poor Charlie Brown. “Revenge is Sweetie” Story & Pencils by Vicki Scott, Inks by Alexis E. Fajardo, Colors by Lisa Moore and Letters by Katharine Efird. Sally does have a kid’s view on love. Sweet love is hard to understand for kids and anyone looking at it from the outside. Cute art though on the characters. “Dirty Dancing” Story by Charles M. Schulz, Adapted by Jason Cooper, Pencils by Vicki Scott, Inks by Paige Braddock, Colors by Bill Bedard and Letters by Donna Almendrala. Peppermint Patty has dirty dancing taken to a whole new level with her date. Here we see young love. It is hard to understand but it is a wonderful thing to see. Pig Pen and all his dirt are illustrated perfectly. 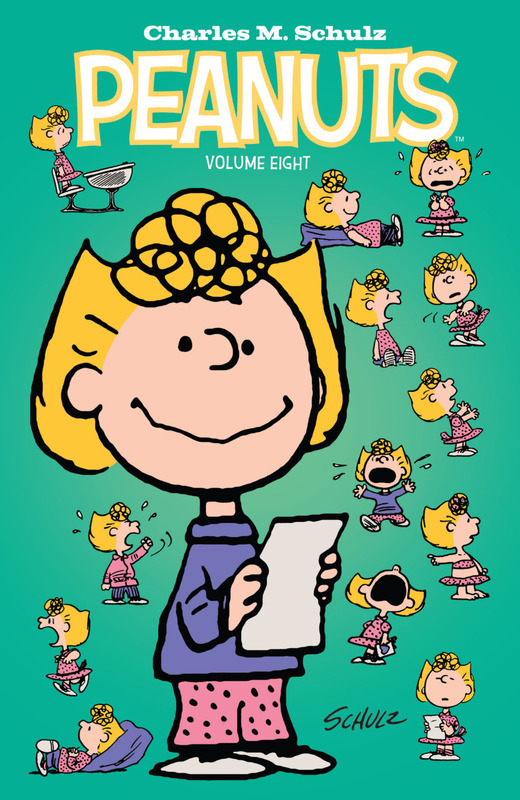 “Get Well Soon, Charlie Brown” Story by Charles M. Schulz, Adapted by Jason Cooper, Pencils by Vicki Scott, Inks by Paige Braddock, Colors by Nina Taylor Kester and Letters by Donna Almendrala. Chuck is in the hospital and we see how all his friends act about it. A promise makes him better and the same promise makes Lucy not so well. Poor Lucy. Pencils by Vicki Scott, Inks by Alexis E. Fajardo, Colors by Nina Taylor Kester and Letters by Donna Almendrala. The trials and tribulations of getting pierced ears is trying. This story is about Lucy and Peppermint Patty. They are a team-up rarely seen and for good reason. They are opposites. “Sunny Disposition” Story by Jeff Dyer, Pencils by Scott Jeralds, Inks by Justin Thompson, Colors by Lisa Moore and Letters by Steve Wands. An eclipse is occuring and Linus is all worried. Turns out Linus was all upset and had nothing to worry about. He was shown as a bundle of nerves. He does over react. “Comic-Con Group Poster” Pencils by Vicki Scott, Inks by Paige Braddock and Colors by Nina Taylor Kester. This is one beautifully illustrated poster with all the gang in it. “Happy Any Day” Story by Charles M. Schulz, Layouts & Inks by Paige Braddock, Colors by Art Roche and Letters by Nomi Kane. Peppermint Patty after thinking about what to get her single father parent for Mother’s Day does come up with the perfect gift. It is one any parent would love. This is a wonderful collection of stories about the Peanuts characters that you are sure to love.